The Food Alphabet and More: "Celebrate Valentine’s Day at home with foodpanda PH"
foodpanda Philippines offers the easiest and quickest delivery of your favorite food from 400+ restaurants online. In a few easy steps, you can order whatever you’re craving! There’s no denying that Filipinos love Japanese food, especially sushi! This Valentines, Sushi Nori crafted Sushi Heart Trays, for that person you’re ‘soy’ into.. Using the foodpanda application will give you a PhP 100 off from the SRP of the Heart Trays of PhP 1,799. No doubt that Japanese might make the significant other Konichi-WOW with this . 2. Frankie’s New York Buffalo Wings’. A romantic trip to NY from the comfort of your home? 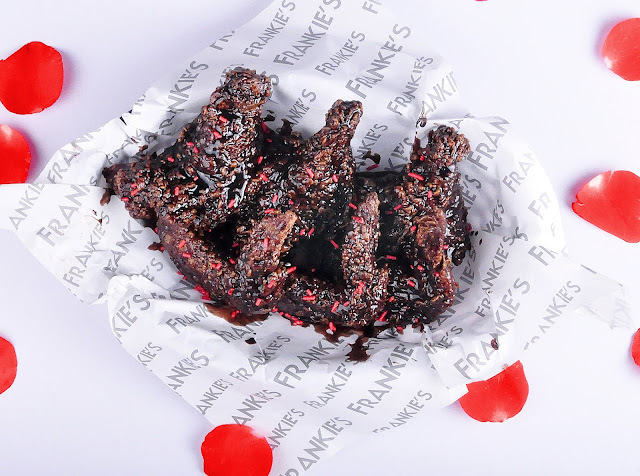 Frankie’s New York Buffalo Wings makes things extra saucy with these decadent Chocolate Wings. Available up to March 30 only and can be ordered by 6pcs for PhP 199 or 12 pcs for PhP 369 – the Chicken Wings plus Chocolate combination will be a rich r combo while you Netflix and Chill. If you want to go traditional with a bouquet and sweets, Boulangerie 22 offers different packages that will suit any budget – ranging from PhP 799 to PhP 999. A sure combo to ignite romance and create sweet memories with your significant other. For this Valentine’s Day, don’t face the stress of traffic and crowded restaurants, head to the foodpanda website or download the app (available in AppStore and Google Play) to savour these romantic dishes while chilling in the comfort of your home with your significant other.